AUTUMNWATCH #3: MAPLE OR SYCAMORE? So then, on to identification of some common leaves… Today we’re tackling some species that belong in the same genus and are often confused: the Norway Maple and the sycamore. In fact, our heading is really a trick question; these are both technically Maples, sharing the genus Acer. They are also relatively common, frequently planted in school grounds, and you are likely to come across them during your Autumn leaf searches. 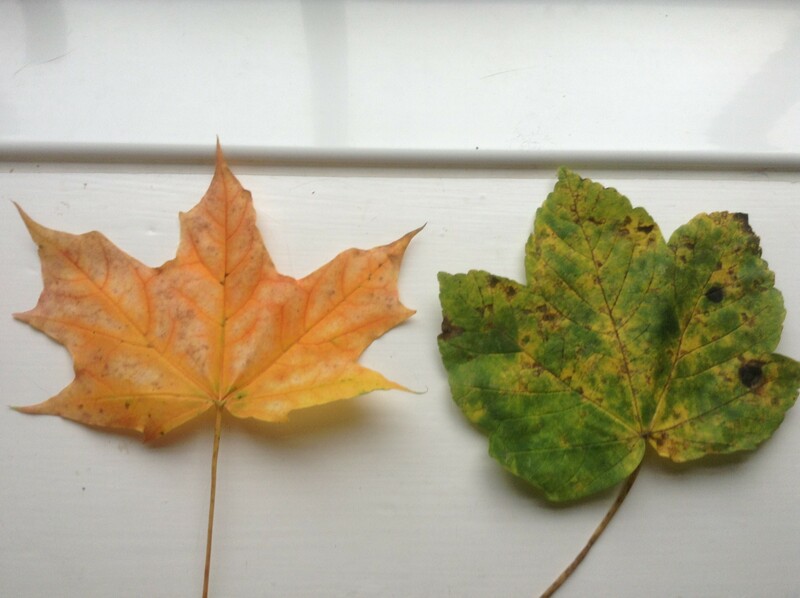 The picture above shows a Norway Maple leaf on the left and a Sycamore leaf on the right. The main difference is that the Norway Maple has a significantly more jagged edge, and a glossier surface. 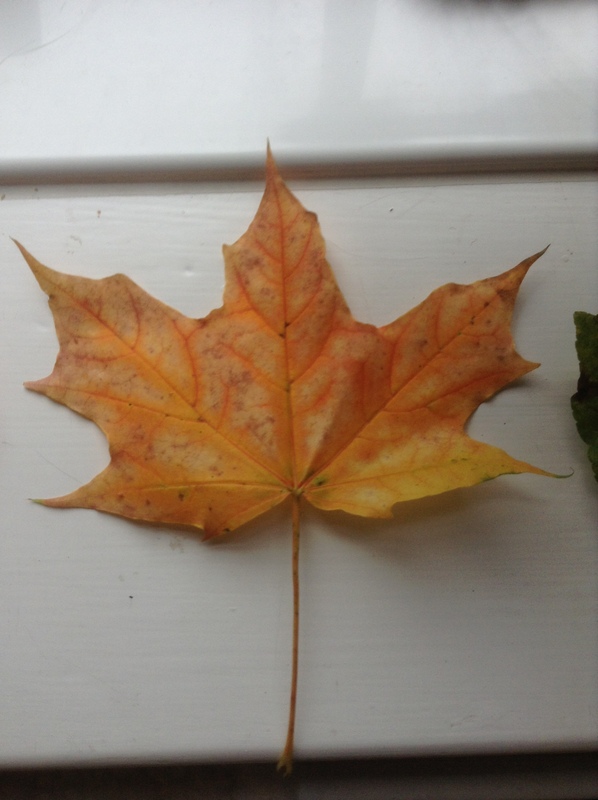 In fact, although not the same species, it looks very similar to the Maple leaf on the Canadian flag. In looking at the full trees, Sycamores also tend to grow higher. In Autumn, the leaves become much easier to tell apart. Norway Maple leaves are some of the first to change colour, turning a blazing scarlet that illuminates streets, parks and woodlands. There’s a dark side to this beauty; actuall,y this red pigment is produced as a side-effect of something called allelopathy. This is the scientific name for a sneaky trick the tree has up its sleeve to fend off competition for resources from nearby trees. 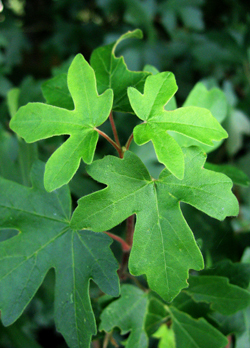 Norway maples produce and release chemicals to hinder the growth of nearby saplings. The blood-red pigments are merely a by-product of this. Sycamore leaves never turn red. They usually go a blotchy green-yellow. This sample is also adorned with black spots; rather than a consequence of autrumn colour changes, this is actually a fungus that becomes an increasingly common sight. Although it doesn’t look so nice, and the trees probably aren’t too happy about it, spotting this is actually a positive sign. The fungus can only flourish in very clean air, so it’s a great environmental indicator for air quality. (OPAL have some tree health surveys based around this that you can do in your school grounds). So, in summary; sycamores grow taller, and their leaves turn yellow. Norway maples turn red, are a bit selfish, and have glossier leaves. Both trees share the ‘helicopter’ keys beloved by children and so useful when teaching seed dispersal, so it;s worth getting to know their names. Before we go, there’s one more maple tree to be mentioned: the Field Maple is smaller and less showy than both of the others. Sometimes it is used as a hedging plant. It’s leaves are smaller and more rounded, and turn yellow rather than red. It too produces ‘helicopter’ keys, but they are much smaller.